Penelope Price Jones was a scholarship holder at the Royal Academy of Music in London, studying with Marjorie Thomas. She later worked with Thomas Hemsley and Paul Hamburger. She sang extensively with choral societies all over the country and had a longstanding recital partnership with pianist/composer Philip Martin, which included commissioned works and regular BBC broadcasts. She made regular visits to the United States where she has performed and given masterclasses at summer schools and colleges including Tanglewood, Aspen, Eastman and Syracuse. Latterly, singing abroad has included such diverse places as the opera house in Funchal, Madeira, the Catholic Cathedral in Naxos, and the concert hall in Kolkata, India. She was made an Associate of the Royal Academy of Music in 1998. Resident in Devizes, Wiltshire, she teaches at the studio in her garden, complete with green roof and lovely acoustics, which has put new enthusiasm into her private teaching, while still acting as visiting teacher at Worcester College, Oxford. Her interest in teacher training was fostered by productive years working as a voice mentor on the Certificate of Teaching run by the ABRSM. She then became Teacher Training Director for AOTOS, developing the annual teacher training course and starting to incorporate aspiring vocal teachers into the training framework. During this time she was involved with the European Voice Teachers Leonardo project, including running the European Vocal Pedagogy week in Marlborough in 2010. 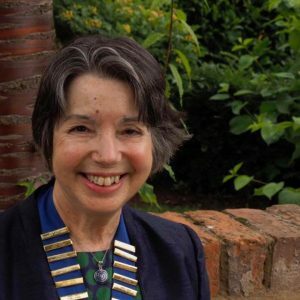 She is an adjudicator member of the British and International Federation of Festivals, and is an elected Deputy on their Adjudicator Council. She held the post of Chairman of AOTOS from 2014 to 2016, during which time the association celebrated its fortieth anniversary. She was also responsible for developing and initiating the new Pathways teacher training courses for aspiring singing teachers, and set up the Songlines Bursary, with many of the funds raised through sponsored walks and workshops held during her chairmanship.